Sclerotherapy is an effective and safe treatment when used by trained and careful hands. Bad results are usually the consequence of an inappropriate use or indication. The best treatment is prevention; however good technique, satisfactory imaging, general precautions, and compliance with posttreatment instructions may prevent some adverse events. Sclerotherapy must be practiced according to the rules of good practice, which is governed by guidelines and international recommendations. of 12 173 sclerotherapy sessions. Abbreviations: DVT, deep vein thrombosis. 128. © 2005, Blackwell Publishing Ltd. In order to prevent complications, the European guidelines provide several absolute and relative contraindications to sclerotherapy (grade 1C). Absolute contraindications include known allergies to the sclerosants, acute deep vein thrombosis or a pulmonary embolism, local infection in the area of sclerotherapy or a severe generalized infection, long-lasting immobility and confinement to bed, and, for foam sclerotherapy, the presence of a right-to-left shunt (eg, symptoms of a patent foramen ovale). Relative contraindications (individual benefit-risk assessment is mandatory) include pregnancy, breast feeding, severe peripheral arterial occlusive disease, poor general health, strong predisposition to allergies, high thromboembolic risk (eg, history of thromboembolic events, known severe thrombophilia, hypercoagulation state, and active cancer), acute superficial thrombosis, and, for foam sclerotherapy, neurological disturbances, including migraines, following a previous foam sclerotherapy procedure. This article reviews the methods for preventing sclerotherapy complications. Tissue necrosis most commonly presents as an ulcer, but it can result in extensive loss of tissue (Figure 1). Cutaneous necrosis may occur with the injection of any sclerosant, even under ideal circumstances, and it does not necessarily represent a physician error. Fortunately, its occurrence is rare and usually of limited sequelae.9 Cutaneous necrosis can occur weeks after the initial insult, and is often associated with pain, localized inflammation, and edema. A bright erythema or a prolonged blanching, also described as porcelain-white appearance, may be seen immediately after injection. Pain can be immediate or delayed. Dermal sloughing starts 24 to 72 hours after the ischemic event and the dermis can turn pale or dusky. To prevent cutaneous necrosis, a careful and methodical technique must be used: (i) stop injecting if there is a feeling of resistance, if a bleb or wheal forms, or if prolonged blanching occurs; (ii) use the lowest volume and weakest concentration of sclerosant; (iii) avoid using rapid and high pressure injections, especially in telangiectasia and reticular veins, keeping in mind that smaller syringes produce greater pressure; and (iv) use ultrasound-guided sclerotherapy for the deeper reticular veins. These recommendation are classified as grade 1C according to the European guidelines.7,8 An indirect injection and an injection with a transilluminator can help avoid intra-arterial injections or extravasation (Figures 2 and 3). Figure 4. Satellite artery close to the small saphenous vein. The extent of cutaneous necrosis is usually related to the site of injection and the amount of solution injected, and ranges from mild-to-severe necrosis of the skin, subcutaneous tissue, and muscle. This complication can follow direct-vision sclerotherapy, ultrasound-guided sclerotherapy, and even catheter-directed sclerotherapy. Theoretically, visualization of the arteries and veins with duplex-assisted sclerotherapy should negate this risk; however, a number of arterial ulcerations have occurred with this technique. Thus, no technique is completely free from this complication. Sodium tetradecyl sulfate has been more frequently implicated in this complication, accounting for 65% of cases vs 11% with polidocanol.23 High concentrations of sodium tetradecyl sulfate can interact with blood to precipitate an insoluble complex of fibrinogen and Apo lipoprotein B29 and induces platelets to release serotonin, a potent vasoconstrictor, which may contribute to a more prolonged occlusion.25 Other cases reported have involved polidocanol. Both liquid and foam formats have comparable rates of tissue ischemia25,26; hence, practitioners should exercise caution when administering both agents and when using either format. The overall frequency of neurological complications of sclerotherapy is around 0% to 2%30,31; the complication include transient events, such as visual disturbances and migraine, as well as ischemic events, such as transient ischemic attacks and stroke, which is an event occurring at a much lower frequency. These complications can result either from a paradoxical clot or from a gas embolism. 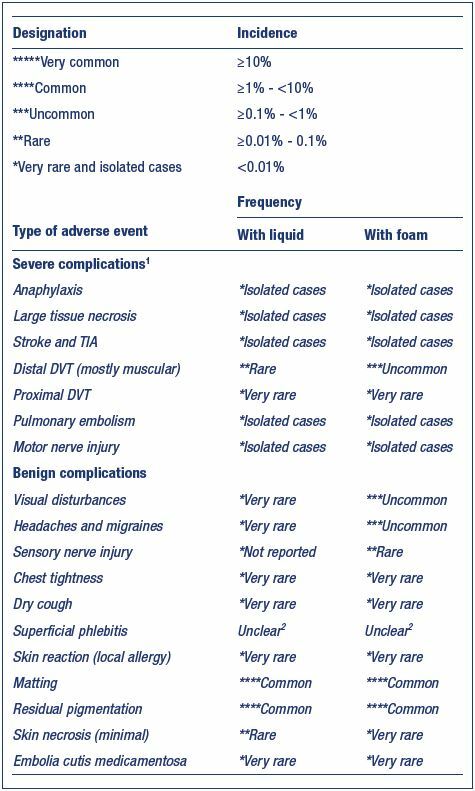 The most consistent risk factors include a patent foramen ovale or another cardiopulmonary right-to-left shunt.12 The etiology of neurological symptoms following sclerotherapy is currently unknown. A systematic review found that visual disturbances may occur in up to 14% of patients undergoing foam sclerotherapy,32 but a recent systematic review found the overall incidence to be around 1.4%.31 The clinical presentation of these visual disturbances is similar to a classic migraine (with aura).32 Patients presented with a headache alone, isolated visual disturbances in the form of a scotoma or blurred vision, headache combined with visual disturbances, and chest pressure that was either isolated or combined with blurred vision or a scotoma.4,5 Transient neurologic events may be observed after any kind of sclerotherapy, although they occur more frequently after foam sclerotherapy and after treatment of reticular and spider veins.4,5,7,8,32 A session of sclerotherapy for telangiectasia lasts much longer than for a session for varicose veins, and, during this time, the foam can change into liquid with large bubbles.4 All cases spontaneously regressed without aftereffects. 1. Assess the patient for a history of cardiac abnormalities or migraine. 2. Limit the quantity of sclerosing solution to 0.5 to 1 mL per injection, as multiple small-dose injections using a low volume of foam can reduce the passage of sclerosant foam into the deep veins and decrease venous thromboembolic complications.48,65 In vitro studies by Parsi30 and Watkins66 have shown that the action of sodium tetradecyl sulfate is inhibited by blood proteins and approximately 0.5 to 1 mL of whole blood deactivates 1 mL of 3% sodium tetradecyl sulfate. 4. Apply compression using compression stockings or bandages after sclerotherapy (grade 2C).7,8 The critical time for thrombus formation in sclerotherapy treated vessels is approximately 9 hours posttreatment. Some authors suggest that compression stockings or bandages are the most beneficial during the night after sclerotherapy treatment and during other periods of relative vascular stasis when an intravascular thrombus is being formed,9 but there is no evidence to support this idea. 5. Elevate the extremity to 30 degrees and implement immediate ambulation or calf movement with full dorsiflexion of the ankle to empty the deep leg veins, including the muscular and soleal sinuses, as this promotes rapid dilution of the solution from the injected area to decrease the risk of thromboembolic events.9 While this is a common practice in sclerotherapy treatment, it is not supported with any evidence. a high risk of venous thromboembolism. to prevent a venous thromboembolism. However, even when appropriate compression is used, thrombosis and perivascular inflammation may still occur. Nerves are readily visualized on most modern ultrasound systems and inadvertent damage can be mostly avoided (Figure 11). 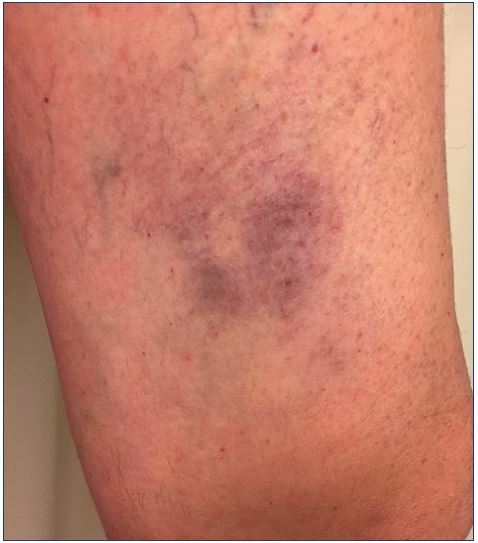 vein within 3 to 4 weeks after sclerotherapy. 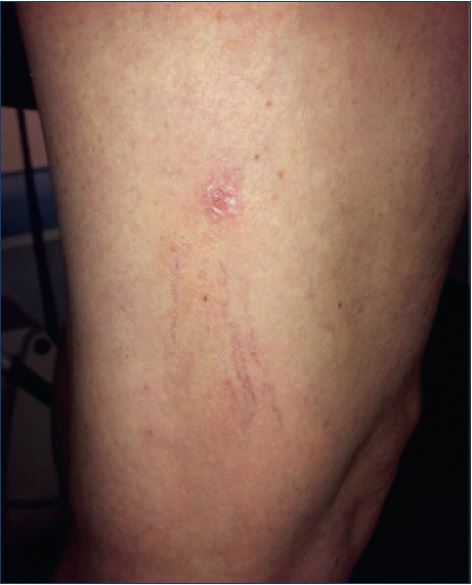 Postsclerotherapy hyperpigmentation tends to be more common with greater amounts of intravascular coagula. Persistent thrombi are thought to produce a subacute perivenulitis that favors extravasation of red blood cells.8 The European guidelines8,80 recommend that intravascular clots should be removed by needle aspiration or stab incision and coagulum expression as soon as possible to reduce the incidence of hyperpigmentation (grade 1C) (Figure 14). Removal of the retained coagulum immediately relieves tenderness and inflammation and may help prevent discoloration.6,80 Microthrombi and larger volumes of intravascular coagulum can be evacuated by puncture with a 16- or 18-gauge needle (depending on the vessel size) and manually expressed or aspired.81 Intervention is recommended within 2 to 4 weeks postsclerotherapy. Preventing the formation of postsclerotherapy-related ecchymosis would theoretically prevent postinflammatory hyperpigmentation by avoiding dermal hemosiderin deposition. Although Arnica Montana is routinely used by many surgeons to prevent perioperative bruising, the efficacy of this homeopathic product has not been scientifically proven.9 Several authors have recommended that patients should avoid taking iron supplements during the course of treatment and for 1 month after treatment.9,86 Izzo et al recommended that patients stop taking drugs that interfere with hemostasis, which eventually lead to bleeding (NSAID, antithrombotic) and drugs and cosmetics that can potentially increase pigmentation (tetracycline, chloroquine, suntan lotion, dyes, bergamot oil).80 European guidelines recommend avoiding UV exposure for the first 2 weeks after sclerotherapy.7,8,80 For high-risk patients, consider another type of treatment or take more rigorous preventive measures. Intravascular coagulum refers to the common occurrence of palpable intravascular coagulum in a treated vessel, that appears 1 to 6 weeks after sclerotherapy (Figure 14). The intravascular thrombus tends to remain liquefied. In a systematic review of four randomized controlled trials of foam sclerotherapy, the frequency of retained coagulum ranged from 7.8% to 55.1%.31 Intravascular coagulum occurs more frequently in larger blood vessels; coagulum retention is usually associated with tenderness and may predispose the patient to posttreatment pigmentation. Vasovagal reactions typically present with a prodrome of nausea, pallor, and diaphoresis, although a sudden loss of consciousness is also possible. Other common symptoms include lightheadedness, feeling hot, and tinnitus. The patient may also have shortness of breath and palpitations. Lack of blood flow to the brain can result in confusion or even syncope that usually provokes the most concern from the physician and staff.87 As the reaction progresses, a seizure may occur, as well as cardiac arrhythmia with a rapid decrease in cardiac output and even cardiac arrest.9 Vasovagal reactions are most often preceded by a painful injection, but may even occur from the patient seeing the needle or smelling the topical isopropyl alcohol or sclerosing solution. The main concern with a vasovagal reaction is that the patient will fall and sustain injuries. Therefore, both the nurse and physician should watch the patient closely for signs of restlessness, paleness, and excessive perspiration. All patients should be warned to sit down if they become dizzy. It is also helpful for the patient to hold onto an arm rail or other support when needle placement is performed on a standing patient, although treatment while the patient is standing is not recommended. All such reactions are easily reversible when the patient assumes the supine or Trendelenburg position. Preventive measures consist of recommending that the patient eat a light meal before the appointment, maintaining good ventilation in the treatment room, and maintaining constant communication with the patient during the procedure. Other serious stress-induced problems include exacerbation of certain underlying medical diseases. Wheezing may occur in patients with a history of asthma or angina may develop in patients with cardiovascular disease. Polidocanol is a negative inotropic agent and slows cardiac contractility in a dose-dependent manner. Urticaria and periorbital edema may be related to histamine release from irritated perivascular mast cells. Urticarial reactions have been rarely observed when using graduated compression stockings. Urticaria may be a sign of a systemic allergy. Therefore, the use of the sclerosing agent in future treatment sessions should be carefully evaluated. Figure 16. 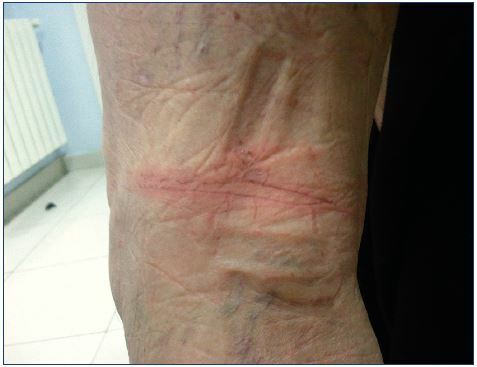 Transitory localized urticaria after injection. Sclerotherapy is an effective and safe treatment when used by trained and careful hands. Bad results are usually the consequence of an inappropriate use or indication. The best treatment is prevention. Good technique, satisfactory imaging, general precautions, and compliance with posttreatment instructions may help avoid some of the adverse events. Sclerotherapy must be practiced according to the rules of good practice, governed by the respect of the guidelines and international recommendations. Foam sclerotherapy is a versatile, effective, and generally safe technique used to obliterate incompetent veins. As with every medical treatment, side effects and complications may occur. Fortunately, most of them are benign, but physicians must be aware of the potential serious events and they should be trained to prevent these events. As with general sclerotherapy, bad results from foam sclerotherapy are usually the consequence of an inadequate use or indication. Complications can happen even to the most experienced practitioner. Adequate knowledge of venous anatomy, ultrasonography, and venous hemodynamics and skills with sclerotherapy techniques are paramount. Furthermore, accurate diagnosis, mapping of the reflux pathway, a detailed management strategy that includes an appropriate follow-up; postsclerotherapy treatment should be used to minimize possible complications. Our improved knowledge of complications allows us to implement a careful approach for decreasing their incidence. Treatment techniques should be optimized to reduce the total volume of the sclerosant foam used in each individual treatment session. 1. The operator needs to have a good training that is specific to the practice of visual and ultrasound-guided sclerotherapy, a good knowledge of venous disease, and a good practice with venous ultrasound. A regular activity in this practice is paramount. 2. 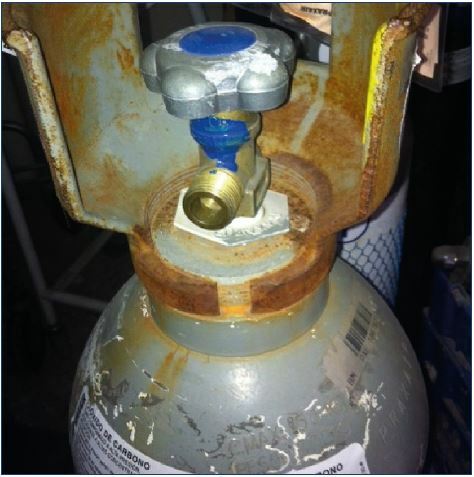 The foam should be made by mixing 1 volume of sclerosing agent with 4 or 5 volumes of gas, with the help of a two-way connector (or a three-way stopcock), it must be of good quality, with no visible bubbles, it must be injected quickly after its preparation to avoid injecting a degraded form, ie, within the shortest possible time between its preparation and its use (<90 seconds). 3. The initial assessment of the pathology must be established in a precise manner to select the best possible tactic, which is adapted to each clinical case. If the incorrect tactic is chosen, then good dexterity is not sufficient. Thus, the choice of the first injection site is decisive, established after a thorough clinical analysis and an ultrasound assessment, and respects the safety of the chosen site. 4. The injections should be administered from the zones of reflux, which are the highest up, toward the distally located veins, and from the largest to the smallest varicose veins. Staged injections allow for the action of the foam, given that the sclerosants is extremely vulnerable once in contact with blood. 5. The choice of the concentration of the sclerosing product is determined according to the diameter of the venous segment to be treated, which is measured while the patient is standing up. 6. The volume injected is determined by the occurrence of a spasm in the target vein and by the homogeneous and compact filling of this vein by the sclerosing foam. The volumes injected are dosed and graduated to avoid overdosing, as opposed to administering a bolus dose at a single point of injection. Treatment techniques should be optimized to reduce the total volume of sclerosant foam used in each individual treatment session. 7. For optimal precision, use a direct needle puncture. 8. Ultrasound guidance should always be used when it is technically possible. 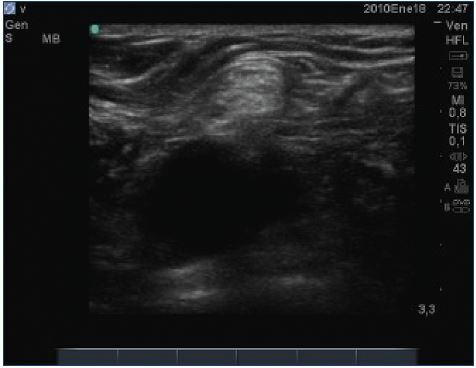 It not only provides permanent ultrasound monitoring throughout the procedure, but it is also useful pretreatment (during the assessment and location phases to determine the safety and pertinence of puncture sites) and posttreatment (monitoring of the foam distribution and the occurrence of a spasm in the treated vein). 9. Indications must be correctly targeted, large saphenous veins (>6 mm) can be treated, but this may lead to more recanalizations. 10. The follow-up assessment on the efficiency after foam sclerotherapy should be performed at least 6 weeks after the injection. 1. Gillet JL. Foam sclerotherapy of saphenous veins—results and side effects. Rev Vasc Med. 2013;1(1):24-29. 2. Rathbun S, Norris A, Stoner J. Efficacy and safety of endovenous foam sclerotherapy: meta-analysis for treatment of venous disorders. Phlebology. 2012;27(3):105-117. 3. Rabe E, Otto J, Schliephake D, Pannier F. Efficacy and safety of great saphenous vein sclerotherapy using standardised polidocanol foam (ESAF): a randomised controlled multicentre clinical trial. Eur J Endovasc Vasc Surg. 2008;35(2):238- 245. 4. 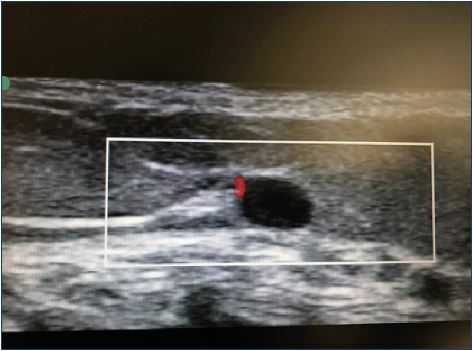 Guex JJ, Allaert FA, Gillet JL, Chleir F. Immediate and midterm complications of sclerotherapy: report of a prospective multicenter registry of 12,173 sclerotherapy sessions. Dermatol Surg. 2005;31(2):123-128. 5. Gillet JL, Guedes JM, Guex JJ, et al. Side-effects and complications of foam sclerotherapy of the great and small saphenous veins: a controlled multicentre prospective study including 1025 patients. Phlebology. 2009;24(3):131- 138. 6. Cavezzi A, Parsi K. Complications of foam sclerotherapy. Phlebology. 2012;27 (suppl 1):46-51. 7. Gillet J; Guideline Group. Complications and side effects: European guidelines for sclerotherapy in chronic venous disorders. Phlebology. 2014;29(suppl 1):34-38. 8. Rabe E, Breu FX, Cavezzi A, et al; Guideline Group. European guidelines for sclerotherapy in chronic venous disorders. Phlebology. 2014;29(6):338- 354. 9. Goldman MP. Complications and adverse sequelae of sclerotherapy. In: Goldman MP, Weiss R, eds. Sclerotherapy: Treatment of Varicose and Telangiectatic Leg Veins. 6th ed. Elsevier Inc; 2017:200-261. 10. Bunke-Paquette N. Complications of liquid sclerotherapy. In: Bergan JJ, Bunke- Paquette N, eds. The Vein Book. 2nd ed. New York, NY: Oxford University Press; 2014:115-126. 11. Brzoza Z, Kasperska-Zajac A, Rogala E, Rogala B. Anaphylactoid reaction after the use of sodium tetradecyl sulfate: a case report. Angiology. 2007;58(5):644- 646. 12. Parsi K. Emergencies in phlebology: anaphylaxis, intraarterial injection, neurological and cardiac repercussions. Phlebolymphology. 2014;21(1):65-66. 13. Scurr JRH, Fisher RK, Wallace SB, Gilling-Smith GL. 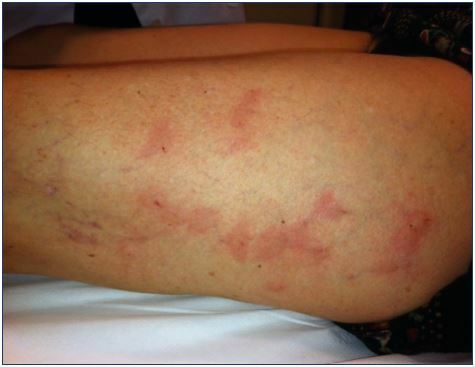 Anaphylaxis following foam sclerotherapy: a life threatening complication of a non-invasive treatment for varicose veins. Eur J Vasc Endovasc Surg. 2007;13:87-89. 14. Bergan JJ, Weiss RA, Goldman MP. 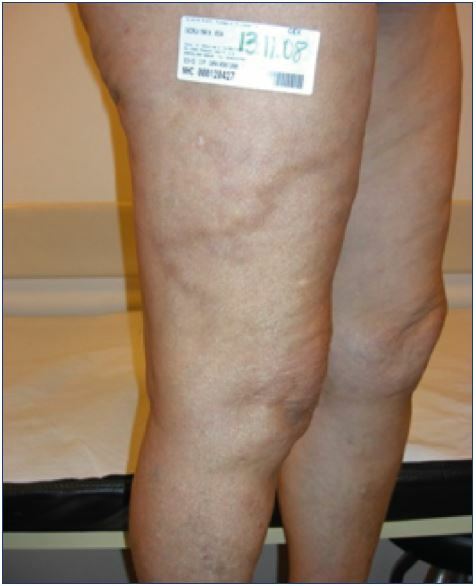 Extensive tissue necrosis following highconcentration sclerotherapy for varicose veins. Dermatol Surg. 2000;26(6):535- 542. 15. Schuller-Petrović S, Pavlović MD, Neuhold N, Brunner F, Wölkart G. Subcutaneous injection of liquid and foamed polidocanol: extravasation is not responsible for skin necrosis during reticular and spider vein sclerotherapy. J Eur Acad Dermatol Venereol. 2011;25(8):983-986. 16. Miyake RK, King JT, Kikuchi R, Duarte FH, Davidson JR, Oba C. Role of injection pressure, flow and sclerosant viscosity in causing cutaneous ulceration during sclerotherapy. Phlebology. 2012;27(8):383-389. 17. Tran D, Parsi K. Veno-arteriolar reflex vasospasm of small saphenous artery complicating sclerotherapy of the small saphenous vein. Aust NZ J Phlebology. 2007;10(1):29-32. 18. Bihari I, Magyar E. Reasons for ulceration after injection treatment of telangiectasia. Dermatol Surg. 2001;27(2):133-136. 19. Parsi K, Partsch H, Rabe E, Ramelet AA. Reticulate eruptions. Part 1: vascular networks and physiology. Australas J Dermatol. 2011;52(3):159-166. 20. Parsi K, Bartsch H, Rabe E, Ramelet AA. Reticulate eruptions: part 2. Historical perspectives, morphology, terminology and classification. Australas J Dermatol. 2011;52(4):237-244. 21. Zimmet SE. The prevention of cutaneous necrosis following extravasation of hypertonic saline and sodium tetradecyl sulfate. J Dermatol Surg Oncol. 1993;19(7):641-646. 22. Brown AS, Hoelzer DJ, Piercy SA. Skin necrosis from extravasation of intravenous fluids in children. Plast Reconstr Surg. 1979;64(2):145-150. 23. Hafner F, Froehlich H, Gary T, Brodmann M. Intra-arterial injection, a rare but serious complication of sclerotherapy. Phlebology. 2013;28(2):64-73. 24. Fegan WG, Pegum JM. Accidental intraarterial injection during sclerotherapy of varicose veins. Br J Surg. 1974;61(2): 124-126. 25. Parsi K, Hannaford P. Intra-arterial injection of sclerosants: report of three cases treated with systemic steroids. Phlebology. 2016;31(4):241-250. 26. Nitecki SS, Bass A. Inadvertent arterial injury secondary to treatment of venous insufficiency. Vascular. 2007;15(1):49-52. 27. Biegeleisen K, Neilsen RD, O’Shaughnessy A. Inadvertent intraarterial injection complicating ordinary and ultrasound-guided sclerotherapy. J Dermatol Surg Oncol. 1993;19(10): 953-958. 28. Jones L, Parsi K. Arteries masquerading as varicose veins: a trap for phlebologists. Phlebology. 2014;30(10):729-735. 29. Parsi K, Exner T, Low J, Ma DD, Joseph JE. In vitro effects of detergent sclerosants on antithrombotic mechanisms. Eur J Vasc Endovasc Surg. 2009;38(2):220-228. 30. Parsi K. Paradoxical embolism, stroke and sclerotherapy. Phlebology. 2012;27(4):147-167. 31. Jia X, Mowatt G, Burr JM, Cassar K, Cook J, Fraser C. Systematic review of foam sclerotherapy for varicose veins. Br J Surg. 2007;94(8):925-936. 32. Gillet JL, Donnet A, Lausecker M, Guedes JM, Guex JJ, Lehmann P. Pathophysiology of visual disturbances occurring after foam sclerotherapy. Phlebology. 2010;25(5):261-266. 33. Lynch JJ, Schuchard GH, Gross CM, Wann LS. Prevalence of right to left atrial shunting in a healthy population: detection by Valsalva maneuver contrast echocardiography. Am J Cardiol. 1984;53(10):1478-1480. 34. Frullini A, Barsotti MC, Santoni T, Duranti E, Burchielli S, Di Stefano R. Significant endothelin release in patients treated with foam sclerotherapy. Dermatol Surg. 2012;38(5):741-747. 35. Frullini A, Felice F, Burchielli S, Di Stefano R. High production of endothelin after foam sclerotherapy: a new pathogenetic hypothesis for neurological and visual disturbances after sclerotherapy. Phlebology. 2011;26(5):203-208. 36. Parsi K. Venous gas embolism during foam sclerotherapy of saphenous vein despite recommended treatment modifications. Phlebology. 2011;26(4):140-147. 37. Raymond-Martimbeau P. Transient adverse events positively associated with patent foramen ovale after ultrasoundguided foam sclerotherapy. Phlebology. 2009;24(3):114-119. 38. Morrison N, Neuhardt DL. Foam sclerotherapy: cardiac and cerebral monitoring. Phlebology. 2009;24(6): 252-259. 39. Asbjornsen CB, Rogers CD, Russell BL. Middle cerebral air embolism after foam sclerotherapy. Phlebology. 2012;27(8):430-433. 40. Leslie-Mazwi TM, Avery LL, Sims JR. Intra-arterial air thrombogenesis after cerebral air embolism complicating lower extremity sclerotherapy. Neurocrit Care. 2009;11(2):247-250. 41. Ma RW, Pilotelle A, Paraskevas P, Parsi K. Three cases of stroke following peripheral venous interventions. Phlebology. 2011;26(7):280-284. 42. Hanish F, Müller T, Krivokuca M, Winterholler M. Stroke following vatical sclerotherapy. Eur J Med Res. 2004;9(5):282-284. 43. Gillet JL. Three cases of stroke following peripheral venous interventions. Phlebology. 2013;28(1):55. 44. Bush RG, Derrick M, Manjoney D. Major neurological events following foam sclerotherapy. Phlebology. 2008;23(4):189-192. 45. Parsi K, Connor DE, Pilotelle A, Low J, Ma DD, Joseph JE. Low concentration detergent sclerosants induce platelet activation but inhibit aggregation due to suppression of GPIIb/IIIa activation in vitro. Thromb Res. 2012;130(3):472-478. 46. Guex JJ. Complications and side-effects of foam sclerotherapy. Phlebology. 2009;24(6):270-274. 47. Myers KA, Jolley D, Clough A, Kirwan J. Outcome of ultrasound-guided sclerotherapy for varicose veins: mediumterm results assessed by ultrasound surveillance. Eur J Vasc Endovasc Surg. 2007;33(1):116-121. 48. Yamaki T, Nozaki M, Sakurai H, Takeuchi M, Soejima K, Kono T. Multiple smalldose injections can reduce the passage of sclerosant foam into deep veins during foam sclerotherapy for varicose veins. Eur J Vasc Surg. 2009;37(3):343-348. 49. 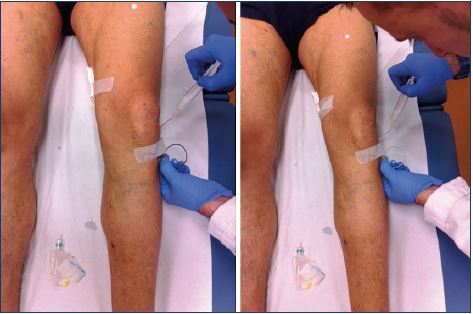 Parsi K. Catheter-directed sclerotherapy. Phlebology. 2009;24(3):98-107. 50. Morrison N, Neuhardt DL, Rogers C, McEown J, Vollis K. Studies on foam migration. Phlebology. 2009;24:88. 51. Hill D, Hamilton R, Fung T. Assessment of techniques to reduce sclerosant foam migration during ultrasound-guided sclerotherapy of the great saphenous vein. J Vasc Surg. 2008;48(4):934-939. 52. 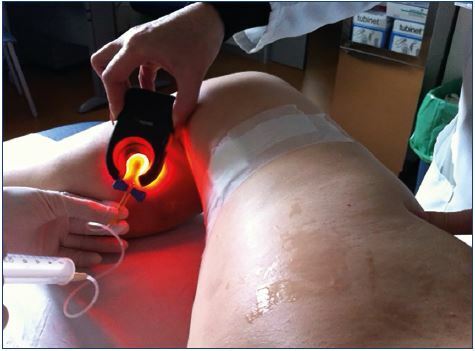 Wong M. Should foam made with physiologic gases be the standard in sclerotherapy? Phlebology. 2015;30(9):580-586. 53. Morrison N, Neuhardt DL, Rogers CR, et al. Comparisons of side effects using air and carbon dioxide foam for endovenous chemical ablation. J Vasc Surg. 2008;47(4):830-836. 54. Peterson JD, Goldman MP. An investigation of side-effects and efficacy of foam-based sclerotherapy with carbon dioxide or room air in the treatment of reticular leg veins: a pilot study. Phlebology. 2012;27(2):73-76. 55. Gryglas A, Smigiel R. Migraine and stroke: what’s the link? What to do? Curr Neurol Neurosci Rep. 2017;17(3):22. 56. Dermody M, Schul MW, O’Donnell TF. Thromboembolic complications of endovenous thermal ablation and foam sclerotherapy in the treatment of great saphenous vein insufficiency. Phlebology. 2015,30(5)357-364. 57. Kulkarni SR, Messenger DE, Slim FJ, et al. The incidence and characterization of deep vein thrombosis following ultrasound-guided foam sclerotherapy in 1000 legs with superficial venous reflux. J Vasc Surg Venous Lymphat Disord. 2013;1(3):231-238. 58. Guex JJ, Schliephake DE, Otto J, Mako S, Allaert FA. The French polidocanol study on long-term side effects: a survey covering 3,357 patient years. Dermatol Surg. 2010;36(suppl 2):993-1003. 59. Gillet JL, Lausecker M, Sica M, Guedes JM, Allaert FA. Is the treatment of the small saphenous veins with foam sclerotherapy at risk of deep vein thrombosis? Phlebology. 2014;29(9):600- 607. 61. Hamel-Desnos CM, Desnos PR, Ferre B, Le Querrec A. In vivo biological effects of foam sclerotherapy. Eur J Vasc Endovasc Surg. 2011;42(2):238-245. 62. Connor DE, Joseph JE, Exner T, Ma DDF, Parsi K. Infusion of foam sclerosant results in a distance-dependent procoagulant activity, haemoconcentration and elevation of D-dimer levels. Phlebology. 2014;29(10):677-687. 63. Fabi SG, Peterson JD, Goldman MP, Guiha I. An investigation of coagulation cascade activation and induction of fibrinolysis using foam sclerotherapy of reticular veins. Dermatol Surg. 2012;38(3):367-372. 64. Shadid NH, van der Velden SK, van Oerle R, ten Cate H, Sommer A, Nelemans P. In vivo effects of foam sclerotherapy on coagulation. Phlebology. 2014;29(5):287-292. 65. Myers KA, Jolley D. Factors affecting the risk of deep venous occlusion after ultrasound-guided sclerotherapy for varicose veins. Eur J Vasc Endovasc Surg. 2008;36(5):602-605. 66. Watkins MR. Desactivation of sodium tetradecyl sulphate injection by blood proteins. Eur J Vasc Endovasc Surg. 2011;41(4):521-525. 67. Hamel-Desnos CM, Gillet JL, Desnos PR, Allaert FA. Sclerotherapy of varicose veins in patients with documented thrombophilia: a prospective controlled randomized study of 105 cases. Phlebology. 2009;24(4):176-182. 68. Gillet JL, Desnos CH, Lausecker M, Daniel C, Guex JJ, Allaert FA. Sclerotherapy is a safe method of treatment of chronic venous disorders in older patients: a prospective and comparative study of consecutive patients. Phlebology. 2016;32(4):234-240. 69. Smith PC. 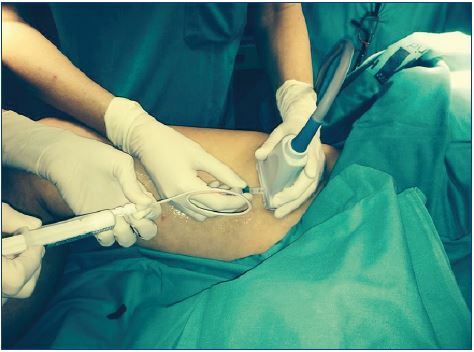 Chronic venous disease treated by ultrasound guided foam sclerotherapy. Eur J Vasc Endovasc Surg. 2006;32(5):577-583. 70. Holbrook A, Schulman S, Witt DM, et al. Evidence-based management of anticoagulant therapy: antithrombotic therapy and prevention of thrombosis, 9th ed: American College of Chest Physicians Evidence-Based Clinical Practice Guidelines. Chest. 2012;141(suppl 2):e152S-e184S. 71. Galanaud JP, Gentry C, Sevestre MA, Brisot D, et al; OPTIMEV SFMV Investigators. Predictive factors for concurrent deep-vein thrombosis and symptomatic venous thrombotic recurrence in case of superficial venous thrombosis. The OPTIMEV study. Thromb Haemost. 2011;105(1):31-39. 72. Bergan J, Pascarella L, Mekenas L. Venous disorders: treatment with sclerosant foam. J Cardiovasc Surg. 2006;47(1):9-18. 73. Cavezzi A, Frullini A, Ricci S, Tessari L. Treatment of varicose veins by foam sclerotherapy: two clinical series. Phlebology. 2002;17(1):13-18. 74. Weiss RA, Sadick NS, Goldman MP, Weiss MA. Post-sclerotherapy compression: controlled comparative study of duration of compression and its effects on clinical outcome. Dermatol Surg. 1999;25(2):105-108. 75. Goldman MP, Sadick NS, Weiss RA. Cutaneous necrosis, telangiectatic matting, and hyperpigmentation following sclerotherapy. Etiology, prevention, and treatment. Dermatol Surg. 1995;21(1):19-29. 76. Munavalli GS, Weiss RA. Complications of sclerotherapy. Semin Cutan Med Surg. 2007;26(1):22-28. 77. Palm MD, Guiha IC, Goldman MP. Foam sclerotherapy for reticular veins and nontruncal varicose veins of the legs: a retrospective review of outcomes and adverse effects. Dermatol Surg. 2010;36(suppl 2):1026-1033. 78. Kern P, Ramelet AA, Wutschert R, Bounameaux H, Hayoz D. Singleblind, randomized study comparing chromated glycerin, polidocanol solution, and polidocanol foam for treatment of telangiectatic leg veins. Dermatol Surg. 2004;30(3):367-372. 79. Rao J, Wildemore JK, Goldman MP. Double-blind prospective comparative trial between foamed and liquid polidocanol and sodium tetradecyl sulfate in the treatment of varicose and telangiectatic leg veins. Dermatol Surg. 2005;31(6):631-635. 81. Scultetus AH, Villavicencio JL, Kao TC, et al. Microthrombectomy reduces postsclerotherapy pigmentation: multicenter randomized trial. J Vasc Surg. 2003;38(5):896-903. 82. Kern P, Ramelet AA, Wütschert R, Hayoz D. Compression after sclerotherapy for telangiectasias and reticular leg veins: a randomized controlled study. J Vasc Surg. 2007;45(6):1212-1216. 83. Hamel-Desnos CM, Guias BJ, Desnos PR, Mesgard A. Foam sclerotherapy of the saphenous veins: randomised controlled trial with or without compression. Eur J Vasc Endovasc Surg. 2010;39(4):500- 507. 84. Goldman MP, Beaudoing D, Marley W, Lopez L, Butie A. 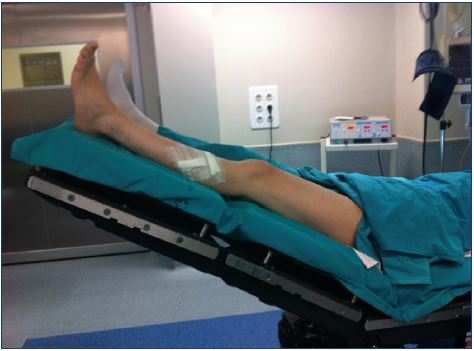 Compression in the treatment of leg telangiectasia: a preliminary report. J Dermatol Surg Oncol. 1990;16(4):322-325. 85. Nootheti PK, Cadag KM, Magpantay A, Goldman MP. Efficacy of graduated compression stockings for an additional 3 weeks after sclerotherapy treatment of reticular and telangiectatic leg veins. Dermatol Surg. 2009;35(1):53-57. 86. Thibault PK, Wlodarczyk J. Correlation of serum ferritin levels and postsclerotherapy pigmentation. A prospective study. J Dermatol Surg Oncol. 1994;20(10):684 -686. 87. Mowatt-Larssen E. Syncope for phlebologists. Phlebology. 2014;29(8): 517-521.